Item specifics can be a bit confusing until you understand what they accomplish in your eBay listing. While many people find your item through eBay search, others may find it through a search on Google or Bing. Since each seller may list the same item with different keywords, there needs to be some universally identifiable information for most products. Filling out the item specifics as thoroughly as possible advantages your item in eBay’s search algorithm. Translation? It could show up near the top of the list of items for sale. Each category on eBay has varying options for which items specifics are requested. Do yourself a favor, add as much identifiable information on your item in this area. It can make a huge difference in how many people find your item. Here’s how to fill out this area. Under the Add item-specific head, be sure to fill out as many of the requested specifics. Below each entry is a box with a drop-down menu; you may find the specific you are looking for there. 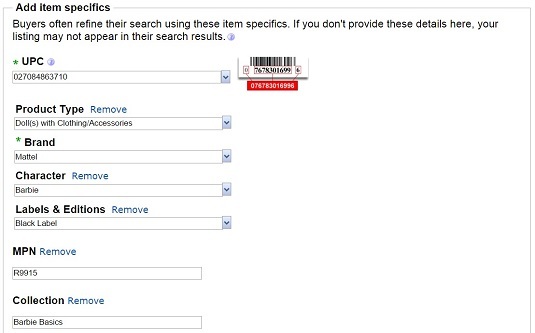 If you don’t see what you’re looking for, select the Enter your own option and type in the appropriate identifier. If you have a specific that is not listed, click the plus sign next to Add your own item-specific text and write it in yourself. GTIN (Global Trade Identifier), which is also known as a UPC (Universal Product Code) number, that appears on almost every retail product. It can be found below the bar code on the package. ISBN number for books. The ISBN number appears below the bar code on the back, or on the inside of the book on the publisher’s information page. MPN: If possible, find the manufacturer’s part number on the item and type it in an existing or custom box. Brand: Type in the manufacturer’s name. Size, color, and edition if applicable. Adding many identifiers specific to your item will pay off in sales.